Through beautiful designs and imagery, LA LA LOVELY invites readers to find their true identity where there is brokenness, discover the love of God, and design their own special place of beauty. Author Trina McNeilly has been blogging for nearly a decade. While she spent her days sharing beauty, looking for lovely things, and redecorating her childhood home, her parents' unexpected divorce shattered her ideals of "home." Through this journey, Trina learned that beauty is not beyond the laundry pile, chipped paint, dirty dishes, broken table or broken life. It's right in the center of it. Trina found that God IS beauty. And that he invites us to look, discover, uncover and find because when we find beauty, we find God. First, I love the feel of La La Lovely in my hands. This book is a great hardcover book that feels more than just any book. I feel like I am reading a sophisticated book that is luxurious. Trina is a transparent writer who writes bearing her heart on her sleeve. She isn't afraid to bare her soul and her unending grace is felt in this book. Not only a designer, but someone who can weave words together, La La Lovely is experience journeying to hard places in your life where maybe you felt that all hope was lost or maybe places where your buried deep pain, but Trina brings life to brokenness and allows each piece to mend into something whole again. The reader discovers that each broken thing serves as a greater purpose and story for someone else, not only themselves. I loved this book! This book helped me deeply reflect in areas of my life where I did not want to travel, but needed too. It also helped me to find peace, grace and love. I also had moments where I need to give grace and also allow God to mend some spots where I didn't realize needing mending. This book has helped me looked at things more intentionally in my life and give myself more grace. I am so thankful for La La Lovely. I am giving a couple copies to a few people in my life who could benefit from it. I give this book 5/5 stars. A favorable review was not required. TRINA MCNEILLY is a writer and founder of La La Lovely, where she has been blogging for nine years, sharing matters of the heart and design related finds. 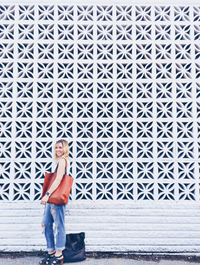 With an eye for beauty, Trina finds inspiration in styled spaces, other times in the broken places, and everywhere in between. Through soulful writing, in the voice of trusted friend, she shares her finds and all about being found. Trina’s work also includes creative direction, styling, and design projects. Trina lives in her hometown, near Chicago, with her husband, and four children. 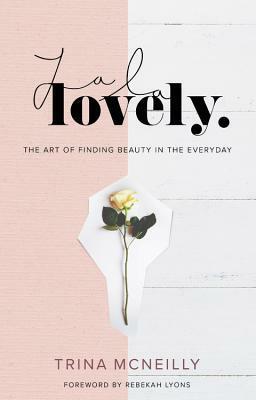 Her new book, LA LA LOVELY, invites readers to find their true identity where there is brokenness, discover the love of God, and design their own special place of beauty.